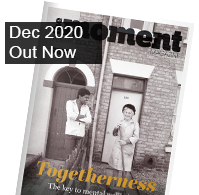 In late 2010 The Moment magazine visited Flag Fen and discovered the hugely important Bronze Age site was struggling for survival. Neglected and seemingly forgotten, visitor numbers were so few that it could no longer justify staying open during weekdays. Now, thanks to some inspired management by Vivacity and an innovative new archaeological dig taking place at the site, this wonder of the ancient world is undergoing something of a resurrection. We paid a second visit to Flag Fen and are amazed at the transformation. The weather contributed to the overall gloom that seemed to be enveloping Flag Fen in December of 2010. It was a damp, dark afternoon when The Moment visited one of the most important Bronze Age sites in Britain, and alternate heavy falls of snow and slush added to the desolate atmosphere. The car park was empty because the site was officially closed midweek, the management unable to fund the staffing of Flag Fen when no-one bothered visiting. The man who discovered the site in 1982, Francis Pryor, seemed resigned to the fact that it would never receive the attention that it needed from fellow archaeologists due to lack of funds and an equivalent lack of interest. After enduring the rigours of time for some 3,500 years, Flag Fen would, Pryor warned, be decayed beyond help in as little as fifty years, its secrets lost forever; neglected, abandoned, and left to rot. Now just 18 months later, the scene at Flag Fen could not be more transformed. The sleet and snow have been replaced by blazing sunshine, flowers and shrubs are blooming everywhere, the once empty car park is now choc-a-block (despite it being midweek), people are laughing and joking in the visitor centre as they enjoy teas and coffees, and the site itself is a hive of activity. This is, in large part due to the hard work of the Vivacity Heritage team who have taken over the site since July 2011, gradually improving, interpreting and promoting the site to a wider audience. 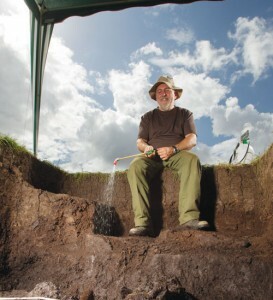 The current burst of activity is centred around a team of archaeologists who are bringing the Bronze Age world of Flag Fen to life thanks to an innovative new method of funding. Crowd-funding is an idea that originated in the United States and is now catching on in the UK. A website-based business model, it allows for various projects from movie-making to recording albums, to be funded by individuals who contribute cash in order to see the project come to fruition. 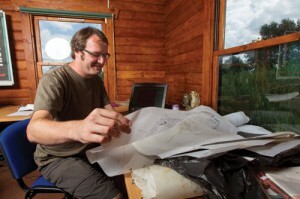 In this case, the project was an archaeological dig at Flag Fen and the target budget was £25,000. That figure was reached – and surpassed – in just 60 days thanks to contributions from 193 people, some of whom paid minimal amounts of £10, and others who paid upwards of £1,300. But the utterly unique aspect of the venture is that those who paid £125 or more got the chance to actually join a real archaeological dig at one of the world’s most important Bronze Age sites. The dig is being carried out by Dig Ventures, the brainchild of husband and wife team, Brendan Wilkins and Lisa Westcott Wilkins. Both are hugely experienced and widely respected archaeologists and they’re joined in the field by Time Team regular Raksha Dave, another of the country’s finest archaeologists. With the economic climate being what it is, a new method of funding archaeological digs could not have come at a better time, especially for a site like Flag Fen which is in real danger of decaying beyond rescue. ‘This is crucial work for this site’ Wilkins says. ‘I’m sure that, under normal circumstances, English Heritage and the Heritage Lottery Fund would have wanted to be part of this dig. But with the economic climate being what it is, it might have been another ten years before funds became available for excavations at Flag Fen and, quite frankly, we just don’t have that amount of time – the archaeology under the ground here is drying out and turning to dust and within 20 years it could all be gone forever. So we felt a real sense of urgency and a call to action over this dig.’ That call to action began in November when the Wilkins formed Dig Ventures and set about looking for a suitable first project. 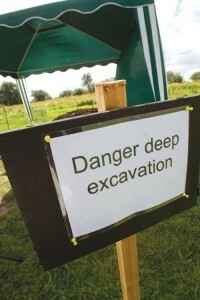 When Flag Fen came up after negotiations with Vivacity, it seemed an obvious choice and the fund-raising began as Lisa and Brendan sat back nervously and watched the Dig Ventures website (digventures.com) to see if any donations would start coming in. Wilkins is in no doubt that the enthusiastic response is at least partly due to the popularity of TV’s hit archaeological show, Time Team. ‘Absolutely without question’ she smiles. Wilkins is delighted with how well the project has been going but wants to encourage even more local people to appreciate the significance of the world famous site that’s right on their doorstep. Perhaps the most exciting thing about Flag Fen is what we don’t yet know. Archaeological digs are an expensive business and the digs themselves are just the tip of the iceberg: the amount of pre-planning required, the expensive field equipment needed on-site, and the analysis of samples after they have been excavated all add to the overall cost. But with the innovative new method of crowd-funding opening up all sorts of possibilities, who knows what may ultimately be discovered at Flag Fen? Certainly, Lisa Westcott Wilkins is thinking big. 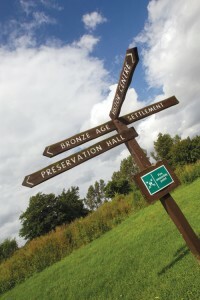 Flag Fen is one of the largest and most important Bronze Age sites in Britain. Buried underneath the fenland to the east of Peterborough are some 60,000 upright timbers and over 250,000 horizontal pieces of wood, still ‘in-situ’ and forming a massive causeway with a central platform larger than Wembley Stadium. Most of the massive structure is still buried underground but one section has been fully excavated and is now on display, housed in a protective building, where it is kept moist and preserved by regular dowsing from sprinklers. It’s still not certain exactly what the site was used for but current thinking leans towards its fulfilling a ceremonial role, which might explain the 300- odd precious artefacts that have already been found there, from gold rings and bronze swords to daggers, axe heads, and metalworkers’ tools. You can see some of these objects in the on-site museum. You can also step inside replica Iron Age and Bronze Age roundhouses and walk along a section of the Roman road which passes through the site. 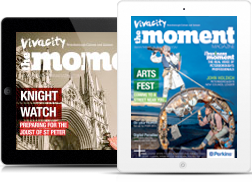 The site is managed by Vivacity, which also runs the recently reopened Peterborough Museum and medieval Longthorpe Tower. Ben Swain is a 19-year-old accounting student from Glasgow. As soon as he heard about the chance to dig at Flag Fen, he packed his tent, caught a train, and has been in his own personal heaven ever since. ‘I found out about the dig through an advert on the Time Team Facebook page. I thought “This is the first opportunity I’ve seen for someone my age to actually have a go at digging myself – properly too, just like you see on TV! My interest stemmed from watching shows like Time Team and other documentaries. I found any programmes that involved excavations incredibly interesting because you just never know what they’re going to find. I originally signed up to dig for one week and that cost me £450 so I just packed a tent and caught the train. But by the time I got half way through that first week I thought it would be too much of a shame to leave on the Sunday so I asked if I could stay for another week and they said yes and then they said I could stay for a third week – which meant the full duration of the dig – so I was over the moon. I had no experience of archaeology at all when I arrived but the team has been incredibly helpful. The main thing is that they trust youalottogetonwith what they’ve taught you and that makes you really raise your game. You can then go and practice what you’ve been taught and learn from your mistakes along the way. I mean, I’ve only been here for a week- and-a-half and already I’m passing on what I’ve learned to other people who are joining the dig as novices. The most exciting part for me so far was when we first struck the wooden posts in the test pit – to see the first piece of Bronze Age wood that perhaps hasn’t been seen in 3,000 years. That was a special moment. I’m doing accounts at Strathclyde University in Glasgow and I’ll probably go into accounting for a few years to get established but eventually I would love to get into archaeology full-time – it’s much more exciting than accounting. Flag Fen is open daily from 10am to 5pm from April to October. Refreshments and gifts are available in the visitor centre. Car parking is free of charge. Family (two adults and up to three children) £13.75.